A Match run by ANGLERS for ANGLERS! You don't need to be a venue expert to win this match just able to catch Bream and Roach of which there are many shoals in the lakes and rivers the match will be staged on. All methods can be fished. Just find yourself a partner and you are guaranteed a chance to win a share in the largest prize ever in coarse fishing. There is nothing more exciting than Pairs fishing and the match attracts anglers from the UK , Belgium, Australia, Germany and Holland and has created interest among clubs Worldwide. This is truly an international event. 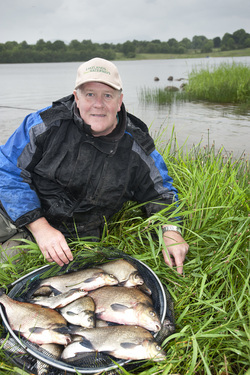 Amateur or Pro you are in with a chance and whether you win or not, nothing beats the fabulous wild fishing in the beautiful Irish countryside. From well known international venues to locally known angling spots the Lakelands region showcases them all to you. This year the match will take place in the counties Leitrim, Cavan & Fermanagh. Many venues are considered but we keep those selected close to our chest until nearer the time - giving you chance to check them out with some pre-match opens on the Saturday and Sunday prior to the event. Not only that, the DAIWA Cup will continue to run inside the World Pairs allowing you to compete as an individual too; providing daily section payouts and a fabulous tackle vouchers sponsored by DAIWA. More details to be provided soon - entry is optional.